In 1925, my brother Lewis Jilbert, aged five, was boarded with our Grandmother, Mrs T.J. Stevens, at 176 Mont Albert Road, Canterbury, a suburb of Melbourne. Lewis attended Chatham Public School. 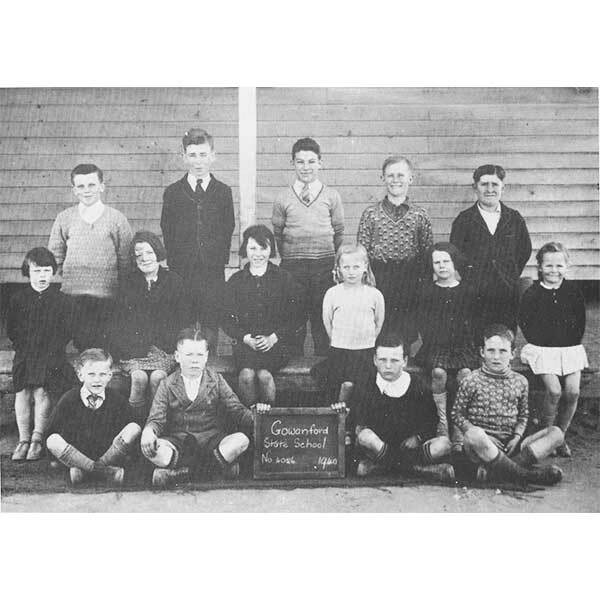 In 1926 I also attended the Chatham Public School. There were about 25 children in each class. In September 1927, the infectious disease Whooping Cough, struck many suburban schools; Lewis and I were very ill. Our mother came to help Grandma nurse us, bringing our younger sister, Ivy, with her, later Ivy also developed Whooping Cough. By the end of the year we returned to our home on the farm, on the Ultima-Sea Lake road. In 1928, our Aunt. Ivy Stevens, drove us each day to Gowanford Public School, a distance of five miles, in a Buggy, driving a pair of horses. My brother Lewis was an excellent student. He completed two grades each year, and gained the Merit Certificate for the 8th Grade in December 1931, three months before his 12th birthday, 2nd March 1932. I was not a brilliant student, after being ill in 1927 I developed some muscular defect in my eyes. The School doctor gave me glasses in 1932. This was of great benefit, and I still wear glasses. I don't think I ever adjusted to the school room having "8" different classes, after the large suburban school, with 25 pupils in one class. Petina Olson came to Gowanford in 1929. She was with me until 6th grade. I was on my own for 7th and 8th grade. I finished school at 14 years of age, in 1935. Mrs. Conway boarded our Teachers in her home. Our Teachers were Mrs. ?, Miss Vera McKenzie, Mr. Edwin G. Prince. Reading, writing and arithmetic were predominant studies. I liked Geography and Needlework and was good at composition. I was delighted when Miss McKenzie said she "would teach us to swim in the Council Dam, if parents and council agreed". The Shire Council granted permission for the swimming lessons and in two summers, of 10 lessons each year, all students learnt to swim. The Junior Certificate was FLOAT, DIVE, and SWIM 10 YARDS. We learnt to dog-paddle. then overarm, then breast stroke swimming. The second year, there was Rescue and Resuscitation of a half drowned person for Senior Swimming Certificate. Ivy had a yellow dress. I had a red dress. I think it was 1931. Our Aunt made our dresses; Mrs. Olson, Mrs Sutton and Mrs. Jury made dresses for Petina, Phyllis and Elsie, if I am remembering correctly. I liked singing. Miss McKenzie taught us with a "Tuning Fork" and we sang the "Scale" in the "Tonic Solfa" using the "Rolling" canvas Notati on Chart. Miss McKenzie then pointed to "notes " to be sung, forth or back or same note twice, or three times and we found we had "Learnt" a tune. The next step was to learn the words that were on the black board, then sing the tune to the words, and we learnt a song. We also sang Rounds very nicely. One grasshopper plague was quite a surprise to us. Driving to school and meeting them on the wing, we had to bring the horse to walking pace, fairly soon, or the grasshoppers stung our faces on impact. If we drove into a swarm on the ground they took flight in seconds and we could not see ahead. The rabbits were trapped continually and we dug some burrows each weekend. We used to stew big rabbits or have them stuffed and roasted. Lewis sold many skins. One year many hares were driven into a netted area in Mr. Goudie's paddock; it took lots of farmers many days to skin the hares. Dad boiled carcasses in 44 gallon drums, for food for the pigs, to tidy up after the "hunt" for the hares. This was done to control thousands of animals eating the young crops People trapped rabbits continually; there was a freezing works in Ultima later. Some years the season was very dry, a lot of dust would rise, when the wind was strong. Dust storms frightened us, a blackout lasted about half an hour or more. I remember the lines of gum trees around the Gowanford School; they were a good wind break. Fathers lopped the trees some years. I do not know when the trees were planted. There were nice trees from the front gate to the school, all planted there before I went to school at Gowanford. The Arbour Days were held before 1928. There was an area fenced, east of the flag pole, which was garden for flowers and vegetables. Some years we grew plants; I remember big boys carrying water from the Council Dam in December, but flowers and vegetables died over the Christmas holidays. There was a very solid and very tall swing, with short cross section on top - cable wire for swinging and very solid seat, south east of the school. I think the swing was made from 2 and a half pine trees. Two pupils could use the swing, one sitting, one standing - this was a favourite play area. The toilets were along the east fence, the senior boys emptied the pans each Friday - the girls swept the toilets and shelter shed. I think Miss McKenzie swept the school during her time at Gowanford. The senior girls swept the school in the morning or afternoon play time for Mr. Prince. The children were obedient when the teachers had some jobs to be done. I do not know when Gowanford School opened or when it closed. I have completely forgotten the number of the school. I think the pupils were happy at school, and received a good education, even if times were hard. I remember wearing lace-up boots until 1930 and then lace-up shoes. Our Father half-soled our shoes, at the weekend. We wore plain serviceable clothes, often made from other people's clothes, by our Aunt. I was rough on my clothes and often tore my skirt. I learnt to "mend" a tear and this made me take more care. The Olson girls wore dark green school tunics, white blouses and green blazers, they looked very nice and were warm in winter. For several years Miss McKenzie held Sunday School in Gowanford Hall each Sunday afternoon. Later my Mother, Ethel Jilbert, conducted Sunday School for some years. This must have been when there wasn't a clergyman to conduct Church Services. The Reverend Williamson, conducted Church of England services fortnightly. All denominations attended the Services; there was a piano in the Hall to help with Hymn singing, otherwise the minister led the singing which was always enjoyable. Mr. and Mrs. Nind conducted the Post Office at Gowanford, 1920's and early 30's and later Mr. and Mrs. Joe Pryor conducted the Postal Service and sold stamps. Mr. Nind used to buy wheat and Mr. Arthur Pepper, who lived north of the Railway Station, supervised the stacking of wheat and loaded the trucks. The Gowanford Hall was south of the Railway Station and was a long building with good stage area, curtains could be drawn across the stage on a strong rod of iron. The dance floor was excellent and everyone enjoyed the dances to music on the piano, with drums and cornet. I think the orchestra came from Ultima. I do not remember the names of people in the orchestra, but Mr. George Ferguson played the cornet for the Last Post at Anzac Day Services in Ultima, I think he was in the orchestra in 1930's. We had sandwiches for supper. One Christmas, Santa's motor car caught on fire and his costume was damaged, this made him late. Mrs. Nind lent Santa their gent's dressing gown, Santa courageously carried out his duties with hands bandaged and burn blisters on his face. Fathers helped Santa distribute Christmas presents, then took him home in someone's car. Other parents had gone to the burnt car to collect the wreckage. In 1936, Ivy drove the gig taking Ken and picking up Ron Jilbert, for the next two years. Ivy continued after the 8th class and her teacher helped her with correspondence course. Ivy studied German as language and managed it very well . Ron Jilbert went with his parents to Swan Hill in 1939 and Ken rode the horse to Gowanford School. When the Second World War began 3.9.1939, help on the farm was short in the 1940's. Ken attended school four days and helped Dad three days. Ken was 14 in 1943. Ivy has told me Ken went to Ultima for some of his schooling . I guess school records will confirm this, or the "closure" of Gowanford School. So many teachers joined the armed services that schools were closed in small communities. Joan of Arc riding a White Horse, holding a shield and spear, was above the fireplace in Gowanford School - a French woman who led soldiers to war, if memory serves me rightly, we could not achieve such bravery. Boadicea, woman driving a chariot, who led English against the Romans, if memory serves me rightly - I need to look up HISTORY. I have never seen the pictures again - picture grey, brown and yellow colour, hung above the store room door, in the Gowanford School. I cannot remember the name of my first teacher at Gowanford School. This lady taught us to place our left hand flat on the page of working book, take up the pencil in right hand, between thumb and forefinger, direct end of pencil over right shoulder towards the neck, forefinger almost straight, then begin writing. I had achieved this method of writing when teacher left and Miss McKenzie came.